My whole grand scheme of tracking my Nanowrimo 08 progress on this Blog didn't work out so well. I guess I realized I'd rather work on my book than tell people (read: no one, currently) how it is going. Here's the re-cap, to be logged in the historical record: I "won", hitting 50,231 words with a few days to spare. On the whole, it was a successful jump-start to my novel. I've set a goal of March 1st to finish the first draft, and currently I'm at around 75,000 words -- right on target, Miss Moneypenny. After that, I'll take a two month break to do Scriptfrenzy, and then get back to the novel. I'm going to try to do a second draft before ComicCon 2009. My sincere hope is to have something good enough to start showing agents and/or publishers by then. I don't like to get into politics too much, but it was a historic day. Honestly, I've been paranoid the last month or so that a McCain victory on 11/4 would kill my writing mood. But tonight's delightful news still had that effect. It's a damn big event, and my mind keeps wandering to it. What can I say? Someday my kids will ask me where I was the day Obama was elected, and I'll be able to say I was at home, writing a novel. My goal tonight of 2000 words was stalled at 1500 by the headlines. Tomorrow I should get my pace back, once the excitement dies off. And I'm still head of schedule, so a little break for celebration can be forgiven. 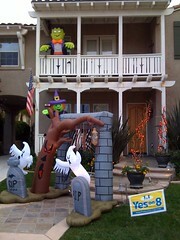 From a house down the street from me: Thought it was mildly ironic that this giant scare-children-shitless display (complete with serial killer Michal Myers music theme playing) has a "Yes on 8" (yes on h8) sign prominently displayed. Won't someone think of the children? Two more days until Nano begins. Probably the biggest difference for me this time around is that I've done this before. Last year was a great experience -- a thrill ride, in truth. As fun as it was, there were a lot of lessoned to be learned. Preperation: My post below details all the prep work I've done up front this year. Last year, I formed my idea about two weeks before 11/1, and wrote an outline that was maybe 100 words. This year I'm using an idea I've been gestating for quite a while, and my outline is 3,300 words. Organization: Last year, I used Word 2007 on a Windows PC. Nothing wrong with that, quite frankly, but all-in-all it was really hard to keep myself organized. This year, I've become a Mac convert, and will be using the wonderful Scrivener to write my drafts. I'll only move it into Word (or, more likely, Pages) when I've got a second draft that I'm ready to start editing. 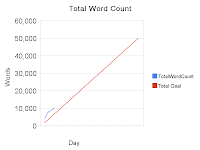 Just a few days left until Nanowrimo 2008 begins! I've been working on my story for a few months, which is a breath of fresh air compared to last year, for which I had only a few weeks to prepare. I'll be keeping a running journal here of how things are going, and the process I follow (so that I can learn from my mistakes, and/or share my success with others). I then used Freemind to start to break all these events down into more and more detail. Two, three, sometimes four levels deep. My outline alone is now 3,300 words! So that's where I am, with three days to go. Feeling pretty good about this one!